Automated, remote controlled LED home lighting is the wave of the future, so why don’t you get on the bandwagon ahead of schedule? In this article, we review the best smart light bulbs currently available on the market, so that you can enjoy the pick of what this high-tech, cutting-edge lighting technology has to offer. Read on to find out more. Down below are our reviews for each of the 10 Best smart LED light bulbs. Compatible with all devices that run on Bluetooth 4.0, this smart LED light bulb provides endless home lighting possibilities and they’re all controlled from the screen of your phone or tablet. Control your home lights individually or as a group. Long lasting and energy efficient LED technology means you will be laughing all the way to the bank here as well. Change the entire way you see lighting with the Flux Bluetooth smart LED light bulb. 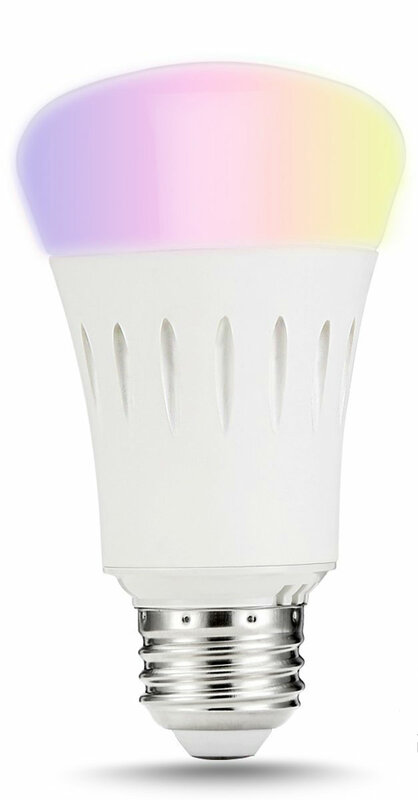 This smart led light comes with over 16 million different colors and tones, 20 lighting modes (fade, strobe, pulse etc), music syncing option, timers, it’s fully dimmable as well – and you get to control it all from the screen of your smartphone or tablet (it’s compatible with all Bluetooth 4.0 devices). Control individual bulbs or your entire home lighting system, program your lighting to turn on at sunrise and off at sunset with the timer function, create wake up lights and nightlights, sync your lighting to the music at your parties – there are so many options here. It’s super easy to set up, just screw in one of the bluetooth lights and install and run the relevant app on your phone or tablet. And because this light utilizes cutting edge LED technology, it’s long lasting (20,000 hours’ lifespan) and super energy efficient – with it’s low power requirements (only 7 watts), there are huge energy bill savings to be made here. In summary, there are infinite possibilities contained within this little smart led light bulb from Flux and the best part is that it is all controlled by the mere push of a few buttons on your smartphone or tablet. The world is literally at your fingertips with one of these smart light bulbs. Go out and grab one for yourself today. Endless lighting possibilities – 16 million colors and tones, 20 different color modes, fully dimmable, music syncing option, timers and memory function, and more. This is just about the best smart lighting system around at the moment. Also functions as a regular bulb in case you misplace your phone or charger! Outsource and automate your home lighting with this LED smart bulb, install the app and you can create and control your very own personalized lighting schedules from anywhere in the world. And with it’s energy efficient and long-lasting LED technology, this is lighting at it’s most economical and eco-friendly as well. The Philips Hue LED lightbulb with smartphone or tablet app enables you to control your lighting at home or away from it with the mere push of a button. Create automated lighting schedules and never come home to a dark house, set up groovy party atmospheres that sync your lighting with the background music, generate wake up alarms and night-lights – the possibilities are endless with this philips hue color bulb. You even get a voice control option. 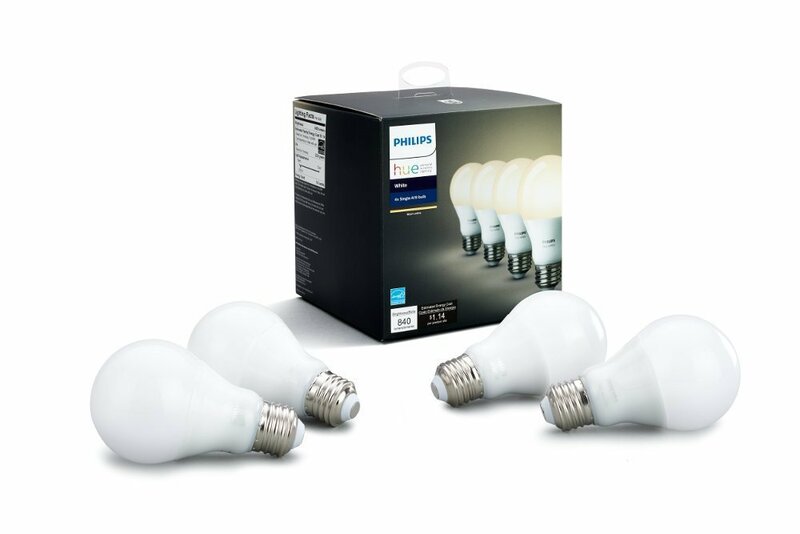 Another major benefit it has it that your philips smart light bulbs utilize the very best of cutting-edge LED lighting technology, far longer lasting and more energy efficient that the alternatives out there on the market – there are energy savings galore to be made with this product. Simply screw in the philips hue bulbs, and install the relevant app on your phone or tablet – it’s compatible with most Bluetooth 4.0 compatible phones and tablets, as well as Google Home, Apple HomeKit and Amazon Alexa. Expand your home lighting system with separately sold Philps Hue accessories such as their Dimmer Switch, Motion Senor or Tap. The sky is the limit with these Philips Hue LED smart light bulbs, never before have you had so much choice and control over your home lighting. It’s one of the best smart light bulbs in existence, so go out and buy one today, it ticks all the right boxes. 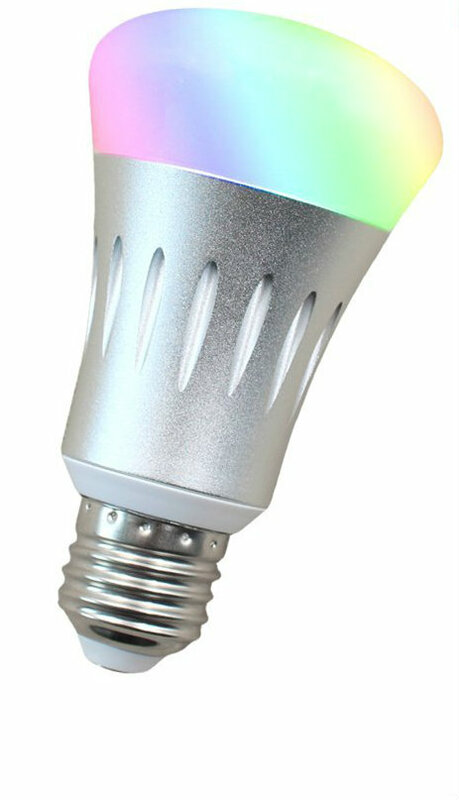 Bluetooth 4.0 compatible smart LED lightbulb and app, control all of your home’s lighting from the screen of your smartphone or tablet, there are infinite colors and lighting modes to choose from; it’s also super easy to set up, and by making use of energy efficient LED lighting technology, will deliver huge energy bill savings as well. 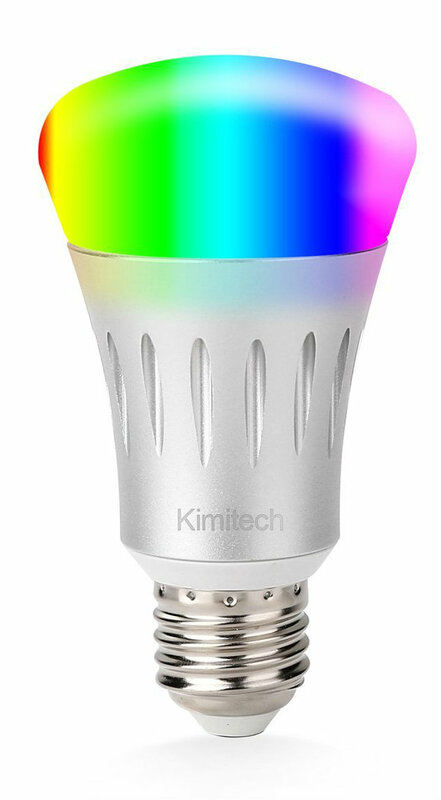 Opt for convenience and control of your LED lighting from the screen of your tablet or smartphone with this MagicLight Bluetooth Smart LED multicolored light bulb. This is a revolutionary new way of lighting your surroundings. Whether it’s to study, relax, create a party atmosphere at your home – this bluetooth led bulb will enable you to do it and all with the mere pushing of a few buttons. It comes with over 16 million colors and tones to choose from, all fully dimmable, 20 color modes (strobe, fade etc), a music syncing option, timers, the ability to control your lights as a group or individually – the sky is the limit with this product. It also has a lifespan of 20,000 hours and with power requirements of only 7 watts is extremely energy efficient, you will save so much money on your power bills with this cutting edge LED lighting. Setting your smart bluetooth led lights up is equally easy as well, just screw in the bulb, install the app, and you are good to go. There are so many lighting possibilities with MagicLight’s Bluetooth smart light bulbs, and not only are they also energy efficient and economical to run, but it’s all controlled via the push of a button on your smartphone or tablet. This is a truly revolutionary new way of lighting. Personalized home lighting is the click of a mouse away with this smart LED light bulb. Simply screw in the bulb, install the app on your phone or tablet, and remote controlled home lighting is yours for the taking. There are so many colors and lighting modes included with this light, and it’s also super cheap to run, utilizing cutting edge, energy efficient LED technology. LOHAS-LED have been providing LED lighting solutions for over a decade and with this latest offering of theirs’ they have really outdone themselves. This LED smart bulb contains multiple colors and lighting modes and ‘scenes’, including dimmer modes, alarms and timers, voice control you can even sync your lighting with the music you play at parties, creating a groovy and dynamic vibe for your guests. Brighten up the room, or create a relaxed vibe for chilling out. Make sure there is always a light on to welcome you when you get home late at night. There are so many possibilities here. And the best part is that it’s all controlled remotely, simply screw in the bulb, install the app on your Wi-Fi enabled smartphone or tablet, and total control of your home lighting is literally at your fingertips, whatever location you are in the world. 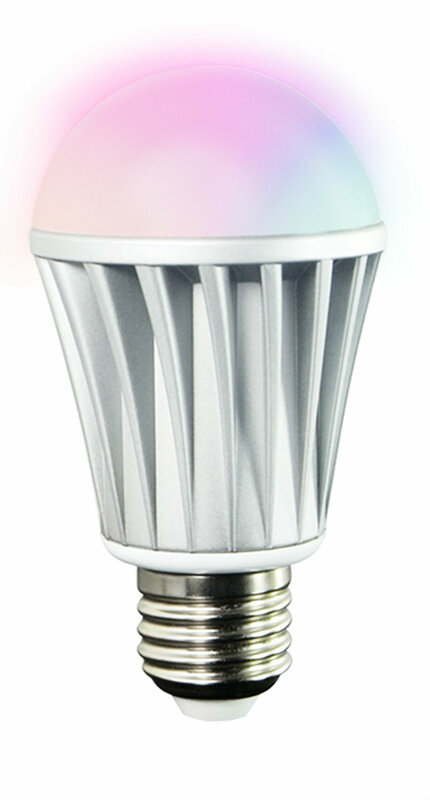 This wifi light bulb also utilizes cutting edge LED technology, so it is super long lasting and energy efficient – you will save mountains of money on your power bills with this light. Control all aspects of your home’s lighting from any location in the world with this LOHAS-LED smart bulb and smartphone app, it’s one of the best smart light bulbs of its kind out there today. Home lighting schedules, night-lights and wake-up lights at sunrise, party lighting – those are just some of the possibilities with this smart LED light. Control all aspects of home lighting from the screen of your smartphone or tablet. And take advantage of the energy savings to be had from long-lasting, energy efficient LED lighting. 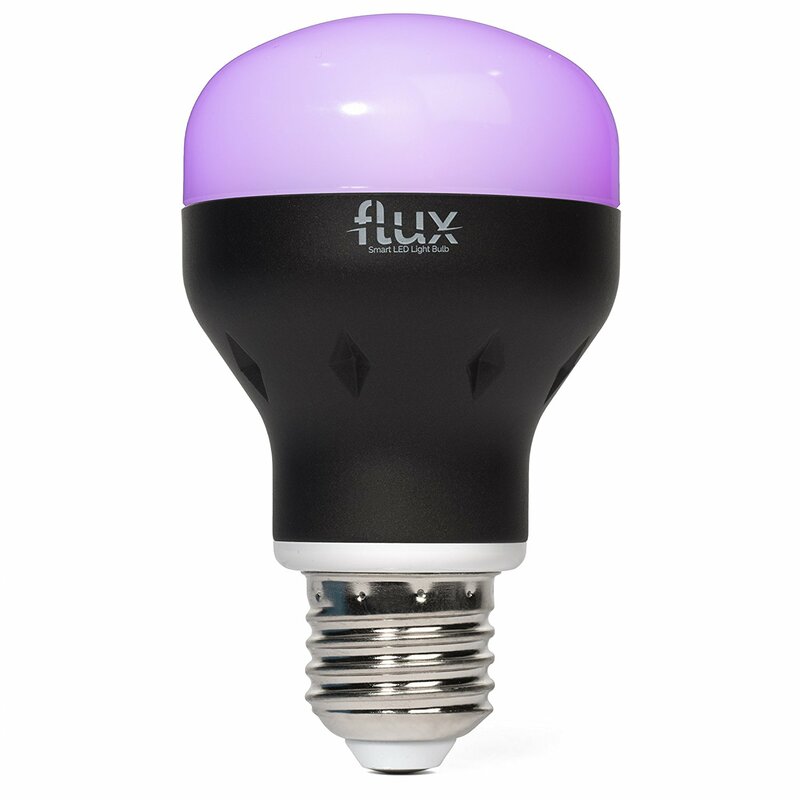 Here we have the Flux Bluetooth 2nd Generation Smart LED light bulb, this product takes remote controlled LED lighting to a whole different level. Control bulbs individually or in groups, set up customized home lighting schedules and timers, have your lights dance and sync with the music playing at parties, alter the color of the light emitted by your bulb – there are endless combinations and possibilities available with this remote control light bulb, and they are all controlled from the screen of your iPhone or tablet. Simply screw in the light bulb and install the appropriate app. And because your bulb utilizes LED lighting technology, you can be sure that this is some of the longest lasting and most energy efficient lighting out there. You will marvel at the savings you generate with this lighting. In short, Flux have really outdone themselves with this offering, there are so many possibilities with this light, and it’s all controlled from the screen of your smartphone or tablet. If you are a fan of automated home lighting, then you could do a lot, lot worse than choose this product. Smartphone or tablet controlled LED home lighting, convenience and cost effectiveness wrapped in the one package, multiple colors and lighting modes to choose from. 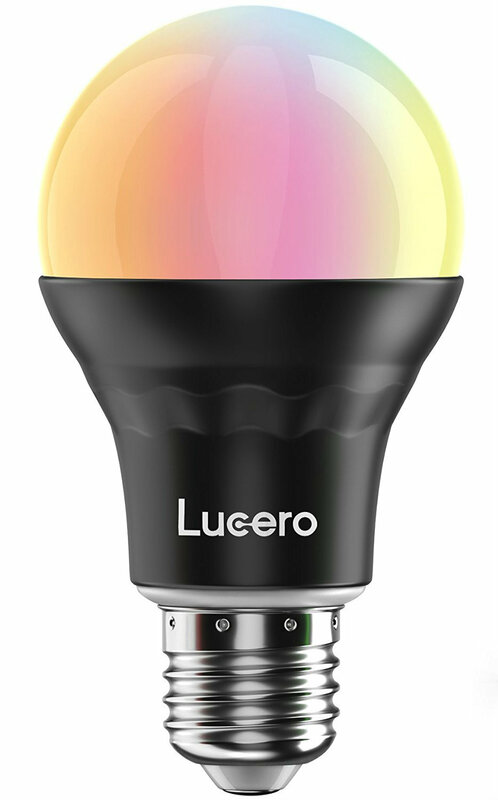 Enhance the level of control and choice you have over your home lighting with this LUCERO color changing smart LED light bulb. Simply install the app and screw in the wifi light bulb, and create personalized lighting schedules from the screen of your phone and tablet. Buy multiple bulbs and control them individually or in a group. 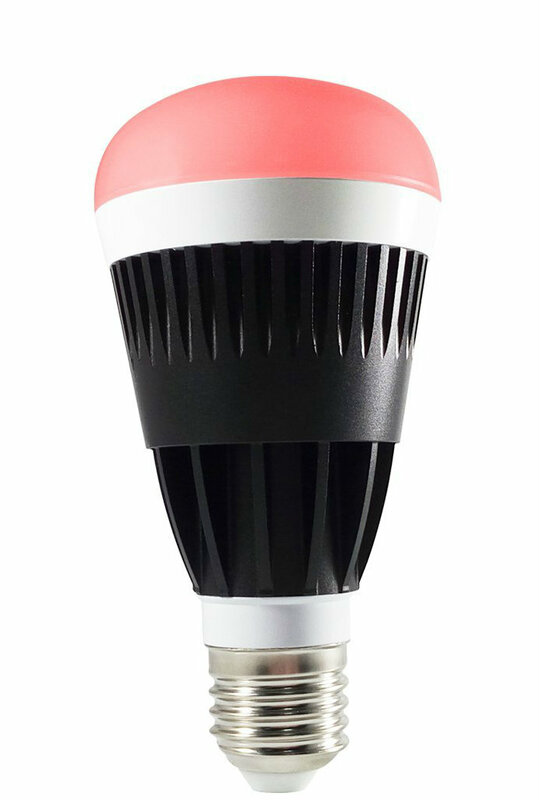 There are over 16 millions colors/tones to choose from, 20 lighting/color changing modes, dimmers, timers and alarms, music syncing modes – you name it, this remote control light bulb will do it. The good part is that the built in memory feature means you don’t lose your personalized lighting sequences whenever you turn off the bulb. And because this is LED lighting, you can be sure it will last a lifetime (20,000 hours) and deliver huge energy bill savings because of it’s energy efficiency and low power requirements (only about 7 watts). Install the light bulb, install the app, and you are good to go – with LUCERO’s LED smart light you can control your home’s lighting down to the finest details. It is one of the best products of its kind out there on the market today. Few smart light bulbs compare to it. So many lighting possibilities here – mood lighting, party lighting, night light or wake up lights. This is one of the best smart led bulb options around today. LED smart light, control your home or office lighting remotely from any location in the world, it’s compatible with all Wi-Fi enabled android and iPhone devices. Personalized lighting is just the swipe of a screen away with this product. And because it utilizes cutting edge, energy efficient and long lasting LED technology, it’s exceptionally economical to run as well. Control your home lighting from any where in the world using the MagicLight Pro Wifi Smart LED light bulb. Compatible with all Wi-Fi enabled android and iPhone/iPad devices, all you need to do is screw in the bulb and install and run the relevant app. Choose from endless color and lighting mode combinations, set up timers and night-lights (it’s fully dimmable), sync your lighting with your favorite tunes – there are so many possibilities with this light. There’s even a memory function so you don’t need to re-program your settings every time you turn the wifi light bulb on and off. Control your lights individually or as a group – customized and personalized home lighting are the name of the game with this LED smart light. And because it utilizes the very best of cutting edge, long-lasting and energy-efficient LED technology, there are enormous energy budget savings to be made here as well with these smart light bulbs. LED lighting has never been more convenient than with this MagicLight Pro Wi-Fi Smart LED lightbulb. Endless lighting possibilities are the mere push of a button on a phone or computer screen away. This wifi light bulb is well and truly recommended. Smart Wi-Fi LED lighting, compatible with all Wi-Fi enabled phones and tablets, enables you to control your home lighting remotely, from any location in the world. Suitable for your day to day lighting needs as well as parties and other events. Control bulbs individually or as a group (up to 50 bulbs). Save money with the energy efficient and long lasting LED lighting technology. For lighting possibilities galore that are the mere push of a smartphone or tablet screen button away, choose the Flux Wi-Fi Smart LED light bulb. With this light, you are presented with more lighting possibilities than you have ever dreamed of, or that you may be able to handle! There are 16 million colors, 20 different lighting modes, timers, dimmers, voice control and music syncing options for home parties, and a whole lot more. Control your lights individually or as a group, the built in memory function enables you to retain your favorite settings between lighting sessions. Your smart led light bulb is compatible with pretty much all Wi-Fi enabled smartphones and tablets, Amazon Echo, and Alex. And if you lose your phone or charger, it doubles up as a regular bulb also! Bear in mind that this is LED lighting, so you can be that it is long-lasting (20,000 hours’ lifespan) and energy efficient – there are huge energy and energy bill savings to be made with this product. 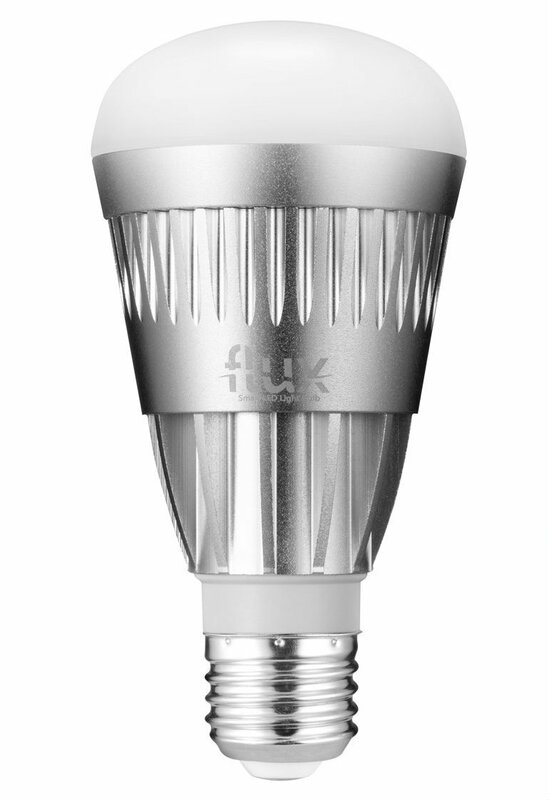 LED lighting has never been so simple, efficient and convenient as with this Flux Wife Smart LED light bulb. It truly is a little gem of a product, their smart light bulbs are well and truly recommended. Wireless home lighting, control your lights from anywhere in the world using Wi-Fi enabled smartphone or tablet. Loads of lighting modes and colors, timers and alarms – create your own personalized lighting schedule. It’s suitable for use at home, in the workplace, at parties and discos – you name it. Get in line with the times and enjoy smartphone remote-controlled home lighting with this product from Kimitech. Select from multiple colors and lighting modes; set up timers, alarms, and schedules; dim the lights to create just the mood you desire – there are so many options with this wifi light bulb. It’s suitable for use at home, in restaurants, bars and discoes, and in the workplace. Most smartphone and tablet devices are compatible with it. Just screw in the bulb and install the app. Bear in mind also that this is LED lighting, so you can rest assured that you are in for an exceptionally long lasting and energy efficient (read: affordable) lighting experience. Endless lighting possibilities await with Kimitech LED smart light bulbs and the best part is that they’re ALL accessible via the screen of your personal smartphone or tablet. Go and grab yours’ today. It’s among the very best smart home lighting in town. Experience remote controlled home lighting from anywhere in the world with this smart LED light. You can choose any color or lighting mode or sequence you desire, set up timers and lighting schedules – the possibilities are endless. And it’s all powered by ultra-long-lasting and energy-efficient LED lighting technology. Remote controlled LED home lighting is the name of the game with this smart bulb from UPSTONE. These folks are a relative newcomer to this market but if this offering of theirs’ is anything to go by they already up there mingling with the elite. This devices comes with over 16 million colors, multiple lighting modes, music syncing feature, timers and alarms, it’s fully dimmable as well – you can create just the mood or lighting schedule you desire with this light, and do it all from the screen of your smartphone or tablet device. Just screw in the wifi light bulb and install the app. Another noteworthy feature of this light is that it makes use of cutting edge LED lighting technology, so you can be sure you will save a lot of money on power bills with this product. It’s also backed by a one year manufacturer’s warranty, which attests to the quality of this product and the confidence the manufacturers have in it. This offering from UPSTONE is the last LED smart bulb product to be reviewed in this article, but it is by no means the least. Highly recommended, go out and grab one of these smart light bulbs for your home today. In this article, we have reviewed the very Best smart led light bulbs available on the market right at the moment. There are some really nifty little products here: if remote controlled lighting from anywhere in the world, with almost infinite colors and lighting possibilities, sounds good to you, then get out there and grab one of these products. You will never look at your home lighting in the same way ever again.